The Brewster lychee tree pictured on the right was planted 3 years ago and the fruit shown are part of its first significant crop. It is located on the eastern side of the house part way under an overhang and has a peach tree planted on its east side approximately 10 feet away. The house gives the lychee afternoon shade and since the peach tree is deciduous it provides partial shade during the hottest parts of the year and allows more sun to come through during the cooler months. The fruit from this tree was surprisingly sweet and juicy, despite the fact that it matured in the middle of July, the hottest time of the year. Lychee trees grow and produce in Phoenix Arizona when they are given a good microclimate and sufficient water. They can handle the lower desert heat as long as they have some protection from the sun during the hottest part of the day. Lychees are relatively hardy for subtropicals, so freeze damage is not a problem unless one lives in a cold spot. 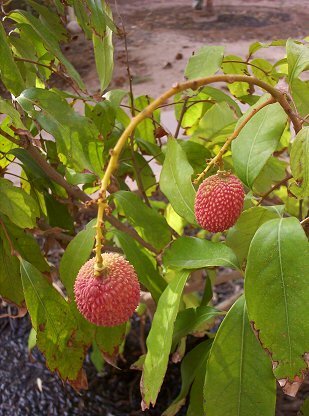 Lychees grow well with mild organic fertilizers such as fish emulsion. Our heavy clay soil prevents adequate aeration of the root system, so lychees do better when large grained sand is mixed in during planting. 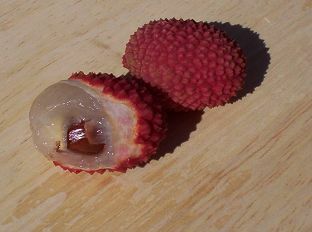 Lychee fruit are about 2 inches in length and look like spiny strawberries. The spiny shell looks more menacing than it is, so lychee fruit can be easily held in the hand. The shell is not edible and is easy to peel away using fingers once a tear has been started. Inside is a gelatinous flesh, the consistancy of a peeled grape, that is very delicious. The black seed in the middle is discarded. Brewster lychee fruit are ripe when they go from a bright red to a very dark red. Lychees add a lot of edible mass in their final ripening stage so it is important to let them fully ripen. Lychee trees are able to handle the heat but the lower desert sun is somewhat hard on them, so it is best to plant them in eastern exposure. Planting a lychee in the shade of a decidious tree is a good way to give it more sun during the cooler months and protect it during the hottest months. Lychees are hardy down to 25 degrees Fahrenheit so frost damage is generally not a problem. moisture and to supply some nutrients. Do not fertilize the newly planted tree until it has been vigorously growing for a couple of months. Lychees do well on a grass watering schedule. They like to have the ground constantly moist but still need the soil to be aerated, which means air from the atmosphere must be able to find its way into the soil. A lychee tree with inadequately permeable soil will get chlorotic (yellow) and unhealthy very easily. The Phoenix area has a very dense clay soil which packs together tightly and becomes like soup when wet, preventing soil aeration. To help make the soil around a lychee more permeable to air one should mix in several pounds of a large grained sand during planting. The typical construction sand you can get at your local big box store works well. If the lychee is already planted, a tool such a hammer drill with a large bit (1 inch plus) can be used to drill holes around the perimeter of the tree which can then be filled with sand. I did such a drill and fill operation around my, already planted, lychee tree and its health improved substantially. Lychees are sensitive to soil salinity. Since Phoenix area water is already high in salts, the safest thing to do is to not use any chemical nitrogen fertilizers. Light applications of chelated iron definitely benefits lychees in Phoenix. During the warm and hot months, regular (every 2 weeks in hot weather) balanced applications of fish emulsion will promote steady growth. Use a mixture of both 5-1-1 and 0-10-10 fish emulsion formulas so that the lychee trees will get sufficient amounts of all macronutrients. Soil amendments such as compost are also beneficial, and occasional deep soakings will help keep the plant healthier. Lychees are most commonly propagated using air-laying. Lychees do not have any significant pest problems in the lower Arizona desert.